After Dean Jones of NYU tells Kramer that NYU student Darren will no longer be allowed to be an intern for Kramerica, Kramer argues that this decision is “capricious and arbitrary.” What does it mean, legally, for an administrative decision to be “capricious and arbitrary”? Is Dean Jones’ decision actually capricious and arbitrary? And, if so, would Dean Jones’ decision to end the internship be invalid? But what exactly does it mean for an agency’s decision to be capricious and arbitrary? It means that there must be no rational connection between the facts of the case and the decision reached by the agency. If the agency is able to articulate a rational connection between the facts of the case and the decision that it made, then a reviewing judicial court will uphold the agency’s decision. A reviewing court uses a 2 part test to determine whether there is this rational connection. Line 2 of this test is whether there was any clear error in judgment, and Line 1 is to look to to the relevant factors that must be considered by the agency when reaching a conclusion. These relevant factors can come from specific mandates by Congress, or they can be general important aspects of the problem. Even if an agency did consider these factors, but it offered an explanation for its decision that runs counter to the evidence, or is so implausible that it feels like fantasy world decision making, then a reviewing judicial court will overturn an executive agency’s decision. While this inquiry of judicial review should be as searching as a “tenacious little monkey,” under this standard of review it also must be narrow. The appellate court must not act like a go-getter and substitute its own judgment for that of the agency. I know! Given this, let’s analyze whether Dean Jones made a “capricious and arbitrary” decision. The only thing we know about the goal of the internship is that NYU wants their students to get “some real world corporate experience.” Therefore, in order for NYU’s decision to not be capricious and arbitrary, the facts would have to show that Darren was not actually receiving this kind of experience. 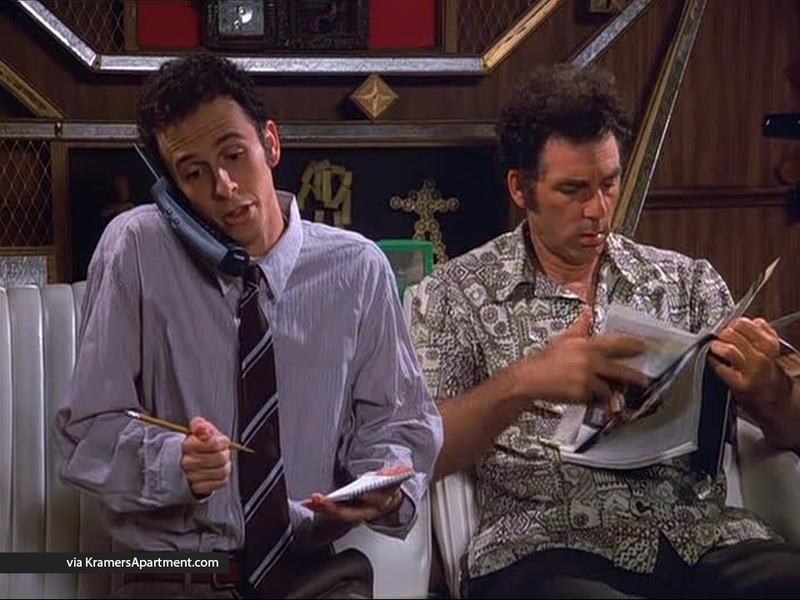 So long as Kramer and Kramerica is in fact providing Darren with the desired real world corporate experience, the internship cannot be cancelled by NYU. It is not hard to make out a rational connection for Dean Jones’ decision, using the facts here, as doing laundry or mending chicken wire isn’t really the kind of real world corporate experience that NYU’s internship program is probably designed for. Kramer could try to argue that filling up meaningless time is exactly the kind of experience that interns get in corporate settings. Furthermore, Darren did have some corporate responsibilities. He learned to take detailed notes during a meeting with George and Jerry and he also learned to schedule appointments when he organized a lunch meeting at Monk’s coffee shop. Nevertheless, it certainly seems like Dean Jones’ decision is rationally related to the facts of the case, and is not capricious and arbitrary. Ironically, once Dean Jones’ cancelled the internship, it seems as if Darren actually did begin to get the kind of experience NYU was looking for. Although Kramerica’s operational structure might still best be defined as “fantasy world corporate experience,” Kramer’s bladder system is an innovative idea, and it is likely that this kind of business entrepreneurship is the relevant experience NYU is looking for their students. Now, it is important to note that this standard of review only applies to governmental administrative agencies, and not the decisions of a private university. Therefore, Dean Jones’ decision regarding Darren’s internship isn’t actually subject to judicial court review under the arbitrary and capricious standard anyway, and Kramer’s protestations are not even legally valid to begin with. That’s a shame.